But even if your career is safe from robot replacement (congrats, Occupational Therapy Assistants! ), chances are good that you’ve read something you didn’t even know was written by a robot. Or more specifically, natural language generation (NLG) software. And we’ll go out on a limb here and say chances are high that it didn’t signal the end of humanity to you, but instead actually made your life a little bit better. Don’t believe you’ve read something that wasn’t written by a human alone? Have you recently had your fantasy football draft? The draft report and weekly matchup recaps might be automated. Our Wordsmith natural language generation software writes these for Yahoo! (millions of them a week). Each player gets a draft assessment at the beginning of the season, followed by a personalized recap of how their team did against their opponent each week of the NFL season. Other sports utilize natural language generation for match recaps as well, including Minor League Baseball. Maybe you don’t play fantasy football, but you can be found playing Call of Duty a couple times a week. 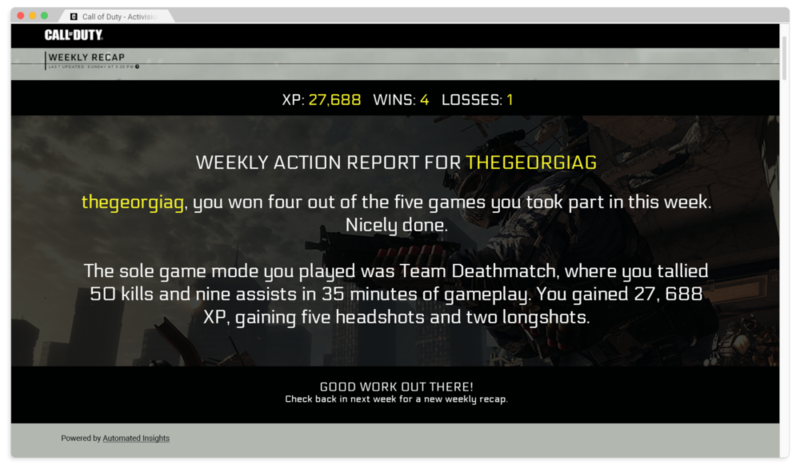 Those individual weekly summaries of how well you played (recapping your wins, number of headshots, etc.) were written by…you guessed it. Software. Or maybe you like to blow off steam in a non-virtual setting. You might be getting your workout recaps from NLG software. 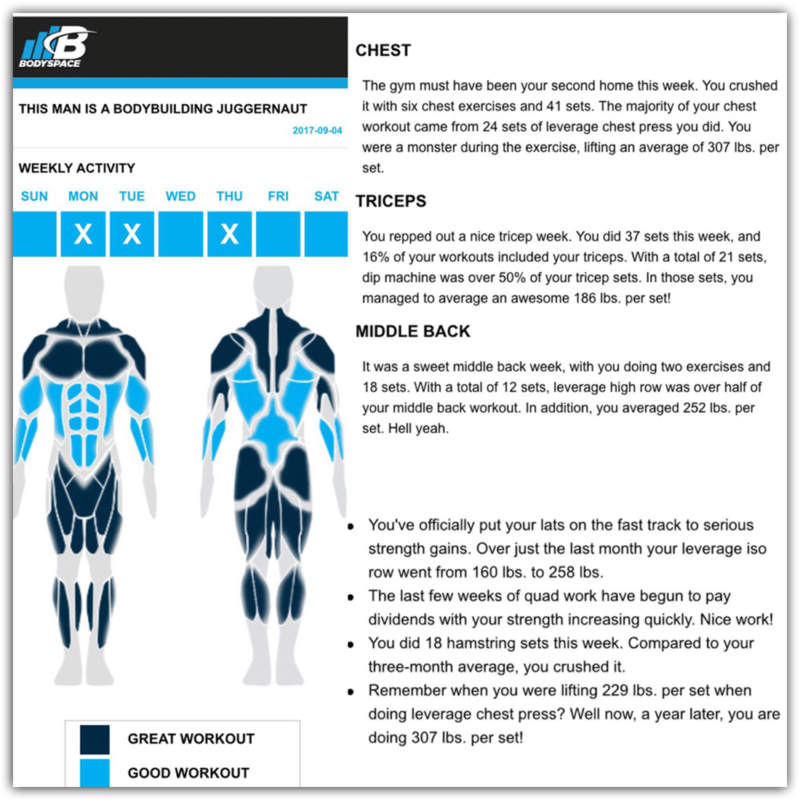 Bodybuilding.com’s BodySpace app sends users their “Rep Recaps” using our Wordsmith platform, providing personalized summaries of their gym time and comparing it to previous PRs to encourage continuation and improvement of exercise. Trying to figure out if you should be bullish on NFLX? The Associated Press publishes corporate earnings stories with the help of natural language generation. In fact, they’ve increased the amount of reports published by twelve-fold since they started using our Wordsmith NLG engine. And it’s not even remotely close to taking the jobs of journalists, it’s making their lives better by augmenting their time and allowing them to focus on the unique human aspects of journalism. Doing a little online shopping this weekend? Content on ecommerce websites can be written by software, both helping pull more search traffic to certain shops and improving the chance you’ll click that “Add to Cart” button. On the market for a much larger purchase? Property descriptions and real estate market reports, like those on the Homesnap website, are also written using NLG technology. On top of all of that, natural language generation is making Voice Assistant devices, like the Amazon Echo, even more intuitive and robust in function and conversation. So no need to worry about robots taking over (at least not through using natural language generation.) Chances are you’ve already read software-generated content and you’re still around to talk about it. 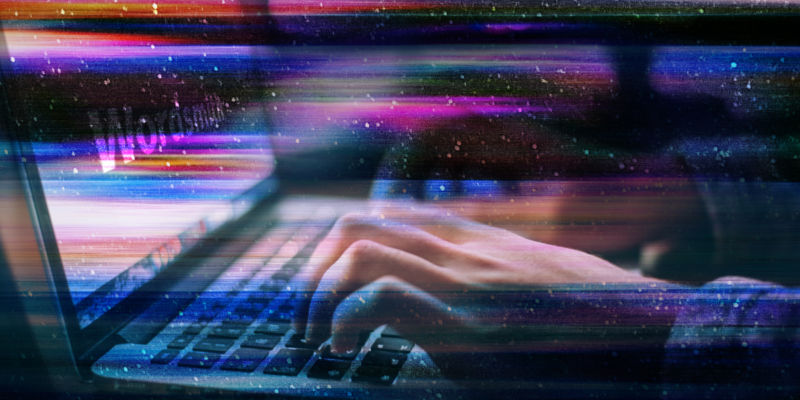 Helping companies fully utilize and make sense of their data with Wordsmith, the world's first publicly available natural language generation platform.